Those Far Out Arrows at Slowdown Jr., Aug. 8, 2017. The band plays tonight at The Sydney as part of #BFF. Supporting #BFF this month is Sean Pratt & The Sweats performing at The Sydney with Mike Schlesinger and Those Far Our Arrows, who I’m told might be rolling out some new songs tonight. Cover is $5, starts at 9 p.m.
And before you head over to The Sydney, cross the street to The Little Gallery (located in the east storefront of the Masonic Lodge Building), where we’re featuring the work of Sophie Newell. You can read about Sophie’s work right here. Stop in, have a beer, check out the art and say hello from 6 to 9 p.m.
Also tonight is the big Curly Martin & Friends concert down at the 1200 Club in the Holland Center. The show is being held in collaboration with Hi-Fi House. This one is SOLD OUT; music starts at 8 p.m. If you haven’t been to 1200 Club, it’s a treat, and Curly Martin is a legend. More info here. 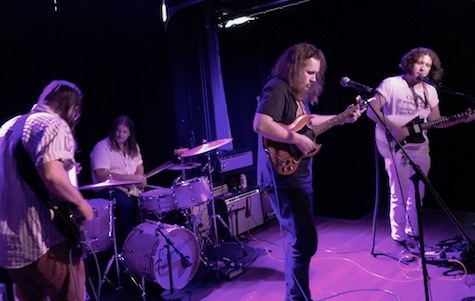 Meanwhile, at fabulous O’Leaver’s, it’s Hussies (Tom Bartolomei, Ben Eisenberger, Jacob Duncan and Brandon Bakkewith), along with Libations and the double-bass attack of Relax, It’s Science. $5, 10 p.m. Tomorrow night is the big Destroyer / Mega Bog show at The Waiting Room. I told you about Destroyer yesterday here, and Mega Bog the day before here. Tickets are $20, showtime is 9 p.m.
Also Saturday night, FiFi NoNo celebrates the release of a new two-song EP at O’Leaver’s. Joining them are Crease and Silversphere. $5, 10 p.m. The show tonight is $5 at the Sydney, just an FYI.